Kim here. 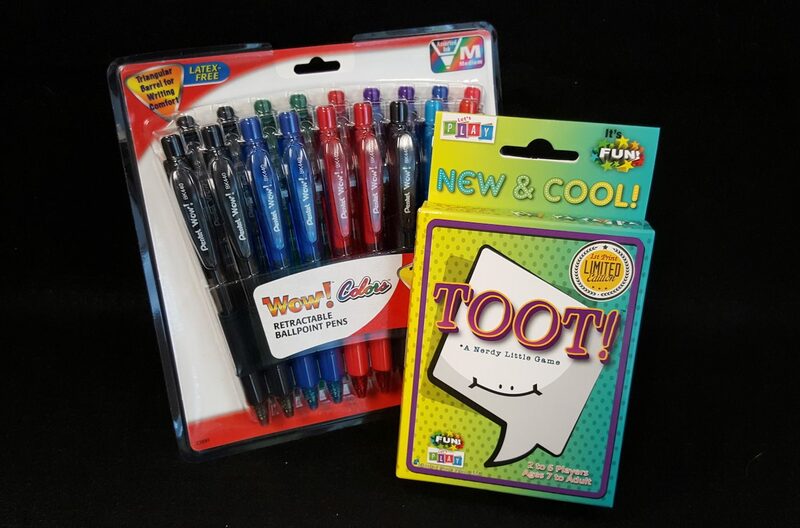 It’s Teacher Appreciation Week and I’m continuing our giveaway extravaganza with a huge pack of triangular barrel Pentel pens and the super fun educational card game, TOOT! Yes, the name of the game is TOOT! Because I am mentally 8 years old, the name of the game made me giggle. And it will probably make your students giggle as well! But with this neat card game, a “toot” is a playable card or group of cards. And there are actually four different games to play with one pack of cards! That’s a lot of educational fun. To enter for a chance to win this prize pack, simply type in the comment section below and tell me the name of your favorite game when you were a child. Just be sure to do this before midnight, May 13. I loved to play Candyland when I was a child…Chutes & Ladders was a very close second. If we’re talking card games, UNO! Crazy 8 and Rummy with my grandma. BEST times ever!!! Rummy with my grandmother also! Best memories. What a wonderful prize package! Thank you for the chance! My favorite game was and still is – SCRABBLE. I loved Chutes and Ladders as a child! I was sick and in bed a lot so I played solitaire! Racko was a family favorite! Seven-up – a game with a ball and a wall! Hi Christine! Congratulations! You’re the winner of the prize pack containing the TOOT! card game and pack of pens. 🙂 Please send me a personal message at kbrugger@themailbox.com with your address and I’ll put the package in the mail. All the best! Candyland was my favorite game. My favorite game was playing 500 Rummy with my grandfather. Scrabble with my great grandparents!! Husker Du was one of my favorites. I remember playing a lot of Crazy Eights, Authors, and Chinese Checkers. My favorite childhood game was Speed! My favorite childhood game was and still is any type of Memory game. I actually collect them!! I still have my first one that I got when I was five and I’m 37 now!! I loved my Mystery Date game. Candy Land, Chutes and Ladders and checkers. My favorite game as a child was don’t spill the beans. I loved playing Old Maid!!! Uno. I’ve never lost a hand!! ???? My favorite game growing up was Monopoly. I always tried to buy up all of the railroads :). Uno was a family favorite growing up. My mom and I would play Scrabble for hours on end. Dad and my brother had no interest! My favorite game was Sorry! Monopoly – we would have games that lasted days. I loved Yahtzee and Uno. My favorite game was Sorry. It was hard to choose because my cousin and I played board games daily. Loved playing Tummy and Scrabble with my mom and dad and Radio with my brothers and sister! My favorite game was Operation. My sister and I would play for a very long time. We would get so upset when we made the buzzer go off. My favorite game growing up was hungry hungry hippos!! ???? ???? I loved to play jacks with my mom. I am 36 years and still play jacks with Mom. My favorite games were Life and Hungry, Hungry Hippos. We played Clue for hours on rainy days! I loved Candyland as a kid! Tripoley was my favorite as a child. My grandmother taught me and my cousins and I have great memories of us all playing together! My favorite game was Payday! I used to play it all the time with my grandma. Scramble was my favorite game. Loved to play Sorry! with my Grandma. Clue and Payday were my two all-time favorite games! My favorite game was Aggravation. My favorite game was Clue and Phase 10. Go to the dump card game and crazy 8’s…cards were a fun and anywhere game still! Anagrams was a family favorite. I loved Chutes & Ladders and Life. My favorite childhood board game was Battleship. I loved strategy games, and still do. I loved UNO as a child! We played games everytime it rained! Such good memories! UNO and Guess Who were the best! Definitely Payday! My siblings and I would play for hours! I was always in a hurry to grow up so I liked adult card games: 31, schmere, whist, canasta, poker, cribbage,.. I loved playing Life!!! Now as an adult I love Cranium. Life; Monopoly Junior; Payday…I love Board Games! Was hard to choose just one, but I’d say as a kid it was mouse trap.